An early 20thc Eastern carved & inlaid octagonal hardwood folding occasional table. This table is profusely carved with leaf decoration of vine leaves & grapes. 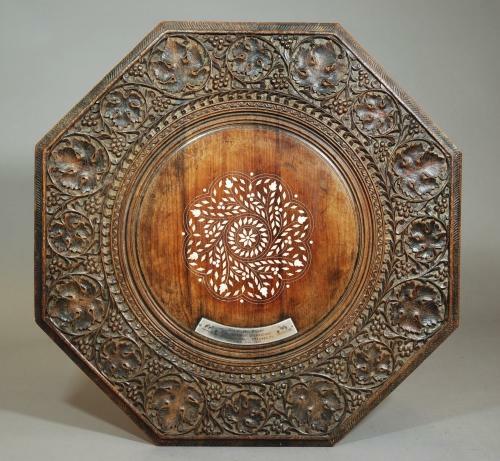 It has a circular inlaid foliage design on the top. The top has the leaf & grape designs & these are also founnd on the base, on the eight sides. This piece can be folded as seen in photograph three & this makes the piece very versatile in modern day living. As seen on photograpgh five this table has a silver plaque stating that it was presented to S/Ldr & Mrs Knight from The congregation & choir of Christchurch, Steamer Point, Aden. There was an RAF base at Steamer Point at this time & Aden remained a British colony until 1963. This piece is of sound construction & is in excellent condition.